Here's a quick run showing how to fit Coale's model of marital fertility using Poisson regression. This is the original example in Brostrom (1985), Demography, 22:625-631. File brostrom.dat in the datasets section has the births, exposure, and the five-year standards na and va in comma-separated format. We find that log M = -0.027 (so M = 0.973) and m = 0.358, indicating substantial control of fertility. 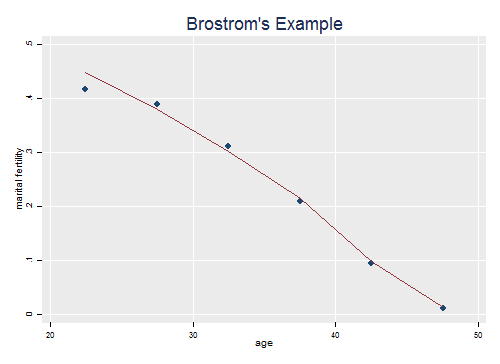 Brostrom obtained log M = -0.026 and m = 0.361 using GLIM. Stata and R usually go an extra iteration. 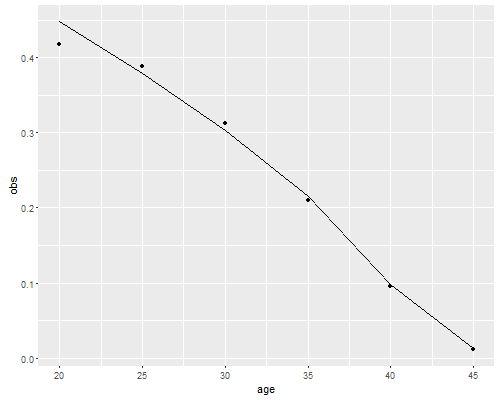 The model fits pretty well, although it slightly overestimates fertility in the youngest age group, 20-24. For comparison, here are the estimates one would obtain using OLS as in the textbook (page 206). The results are similar, with logM = -0.29 and m = 0.393. A useful diagnostic plot is log(f(a)/n(a)) versus v(a), as that relationship should be a straight line, which is then estimated by OLS or Poisson maximum likelihood. For an example see Box 9.3 in the textbook.